“Vacation No Problem Alfamarine" is the service activated by Alfamarine Shipyard of Fiumicino to the owners of the yachts of the 30 year old Roman shipyard of Marcello and Andrea Fazioli. This new initiative will be operational from 1st July, and provides a technical assistance from the builder to its yachts when trouble shooting arises. Thanks to an agreement with Aquaairline Spa, Alfamarine technicians will be able to reach the trouble yachts in all the Mediterranean onboard the hydroplanes of the company, specialized in this sea area. Like this the troubled boat will be able to resolve its problem and continuing its sea trip in perfect harmony, with the only detail requested from the owner to the Operational centre would be the age of the yacht and the parts needed. The total cost of the operation will be the part and aerial transfer. 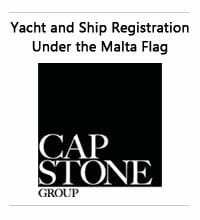 The partnership between Baia Yachts and Capri Yacht Club for Rolex Capri Sailing Week go on successfully. 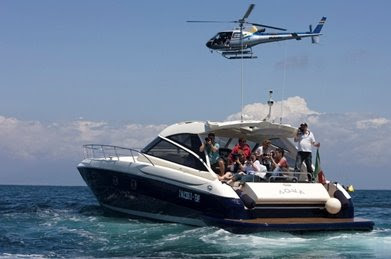 In order to follow one of the most prestigious regatta in the international sailing races’ outline , Cantieri di Baia gave as supporting boats an Aqva 54’, fast and easy to handle during sailing races, and a One 43’ , the fast day cruiser with more than 20 m2 cockpit, that allows to work easily in it. After the great success achieved in the last edition by Roy Capasso and Alessandro Conti with “Aris”, an Azzurra 63, Baia Yachts will take part again in the nautical rally raid Viareggio – Montecarlo - Viareggio, with three teams in the starting lane. In this 5th edition, from May the 30th to June the 1st, Alessandro Conti and Mario Borselli compete with an Azzurra 63, Stefano Marianelli and Paolo Mataloni with an Aqva 54 and Christian Power, Steve Packham and Susanna Monacci with a B80 USA. The first lap of the 5th raid Viareggio – Montecarlo - Viareggio will start on May the 31st at 10.30 a.m. and is going to finish with the competitors arrival in Monaco. The winners of the first lap, during the gala night in the Yacht Club de Monaco, will be awarded with the 3rd Memorial Stefano Casiraghi, a trophy in memory of the former Offshore World Champion. 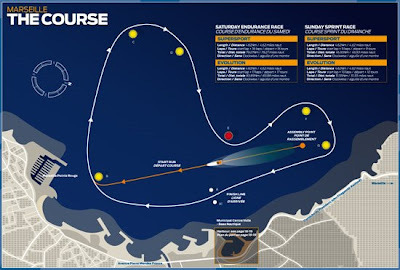 The second and final lap, starting on June the 1st at 10 o’clock a.m. will be on the same track in opposite direction, and the awarding will take place at Yacht Club Versilia in Viareggio Harbor. The winner team will be awarded with “FIM Trophy” in memory of Angelo Moratti, who was FIM Chairman in the past. 18 years ago Bruno Abbate had the brilliant idea to organize a gathering race with his boats to be held in full summer season in the most beautiful Italian marinas where owners and personalities from the show biz and sports world (Alberto Tomba and Jerry Cala the most famous) joined hands for a navigation competition with a fun experience. Time showed that the idea was a winning one and it is not the case that the Primatist Trophy is now in its 18th series. This year’s edition will be named “Ogliastra Cup” and will be held in Sardegna, where Bruno Abbate has invested a lot for the future development of the brand. From 27th July to 1st August, from Portisco to Arbatax touching the suggestive Oriental Sardegna coast, navigating trough natural beauties from Mortorio to Tavolara, between pure speed racing and classic ruling. The main theme of the competition will be the glamour, joining with the peaceful relaxing of a years work being a common denominator for those that go at sea in the summer period. Other news for this year’s edition there will also be a new star: the new Bruno Abbate Primatist G 53 Pininfarina that will be officially presented in the days preceding the event and has already received various positive reviews from the professionals. Another plus of the Primatist Trophy is the huge media impact this event has on a national and international level, with 5 hours a day being followed by TV crew, including a helicopter filming that will be distributed to the most famous news sections, as are the photographs distributed in real time and media communication with placing and charts all distributed. Famous Italian Sport newspaper Gazzetta dello Sport will also dedicate a 5 page special on the Trophy, along with the inhouse magazine Primatist People. A lucky collaboration had to be repeated. For the second year in a row Bruno Abbate Primatist was a partner sponsor for the World Rally Championship, Sardegna stage held from 15 to the 18th May. Bruno Abbate confirmed the speed vocation and tradition, is not a case as are the sponsors in Moto GP with Loris Capirossi and F1 Inshore with Guido Cappellini. Apart the Primatist stand, in the pit area there was also the possibility to admire the G41 Offshore Line , located in the assistance parking of the Rally and a G 41.2 Aero Top Evolution being moored in the waters at Cala di Volpe. Cabo Yachts laid off 49 employees last week, according to a story in the Victorville Daily Press. The Brunswick division said that about 300 workers are still with the company in Victorville Industrial park. Cabo Yachts said that international sales are going well, but that US business is hit hard. Cabo has increased investment in new boat models and engineering in the last year, waiting for the improving in US economy. Finnish sailboat brand Nautor's Swan has teamed with French superyacht builder and member of the Couach group, International Marine Service (IMS) to open a superyacht service yard on the south coast of France. Nautor and Couach/IMS have formed the company Yachting Service Excellence Center (YSEC), which will open the service yard at an ex-military base in Saint-Mandrier at the end of 2009 or beginning of 2010. The total to be invested in the project amounts to €22m, which includes funding from regional authority Toulon Provence Méditerranée. Three lots will be in operation at the site: a YSEC lot, which will include a painting area and two boatlifts capable of living boats of up to 50m (164ft); a Couach lot, comprising two sheds and a surface area of 27,000sq m; and a Nautor's Swan lot. Director General of IMS Eric Robert-Peillard says that the association with Nautor came from both companies response to the offer of the site at Saint-Mandrier. He also says that the yard will operate in addition to IMS's current activities. IMS is already based in Saint-Mandrier, while Nautor's Swan has yards in Finland and offices in Italy. Italian yacht brand Fashion Yachts inaugurated its Pisa yard on Italy's Mediterranean coast on May 10. The 30,000 sq m site will be used to produce Fashion yachts ranging from 55ft-197ft (17m-60m). The brand currently has 11 models on offer. Models on display at the inauguration included the Fashion 55 and the Fashion 68, which features a gold leaf floor. Visitors were also able to see the new Fashion 88 in production.Tuscan company Fashion Yachts Group was established in 2002 and offers yacht building, charter and brokerage services. De Vries Makkum Shipyard, one of two De Vries yards in Royal Dutch Shipyards group Feadship, has been named Frisian Company of the Year following a public vote in the Dutch province of Friesland. A jury of experts from local government and industry praised the yard's professionalism and innovation.De Vries Makkum is primarily responsible for building the new Feadship XL range and for refits of Feadships. 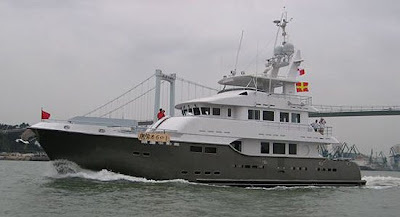 Feadship brand is the cooperation between Koninklijke De Vries Scheepsbouw, Royal Van Lent and De Voogt, and produces custom-built motor yachts. Hatteras Yachts, a unit of the Brunswick Boat Group in the US, has appointed Luca Brancaleon as director of sales and business development for Europe, the Middle East and Africa (EMEA). Reporting to George Armendariz, VP and general manager of Brunswick Marine in EMEA and vice president of sales for Hatteras Yachts, Brancaleon will be responsible for overseeing and supporting the Collection's current EMEA dealers, while working to grow the dealer network. He will also establish new relationships in evolving markets. Brancaleon will take up his new position on July 1, 2008. He currently serves as sales manager of Sessa Marine's international dealer network. 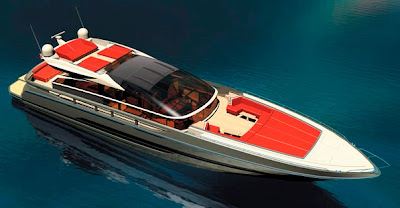 Riva and Bentley got together from May 21st to 23rd 2008 to present at once their main models in Genève. The Swiss distributors of the two brands, Cantieri Poroli and André Chevalley SA, organized in fact a three-day event open to public inside the Bentley showroom, where visitors had the chance to admire, beside two cabriolet models of GTC and Azure, also an example of Aquariva Super, the spider of the sea. The 33 footer, evolution of the Aquariva model, whose engines have been improved to 380 hp each in this version, was presented in the elegant Chocolate Brown color, immediately achieving a huge success among visitors. On the evening of Thursday May 22nd, moreover, a private cocktail was organized for Riva and Bentley’s guests inside the showroom, during which the Aquariva Super was put at disposal also for visits onboard. The histories rich in tradition of Riva and Mille Miglia, the most famous historic cars’ race in the world, meets up in 2008 to create a new project merging the values that have made the two myths unforgettable. The partnership foresees the production of an Aquariva Mille Miglia model, studied by Mauro Micheli and Officina Italiana Design, the team that creates all the Riva Yachts, and inspired by the 80th anniversary of Alfa Romeo’s first victory, won by Giuseppe Campari and Giulio Ramponi in a 6C 1500 SS Spider Zagato in 1928. The one-off example of the Aquariva Mille Miglia model will be sold at the auction to be held by the organizing committee of the race during 2009 edition, while a maximum of ten more units could be produced and sold to the two myths lovers. The project was presented at the Mille Miglia 2008, held from 14th to 18th May, when Riva displayed the drawing of the model that will be realized next year in an elegant stand inside the paddock where the participants’ cars were parked. Beside the blow-up of the Aquariva Mille Miglia, participants, among which there was the Chairman Norberto Ferretti, and the public come to see from closer the classic cars had the chance to admire an example of Aquarama, an Aquariva Cento and a Seppietta. This last one, a racer dated 1935, part of Mr. Ferretti’s private collection and normally preserved in the shipyard’s Gallery, was exposed to public for the very first time, immediately achieving great curiosity among visitors. 166 years after its birth, with this project Riva has therefore come back to the racing world that had seen her as a protagonist of the first nautical competitions in the early ‘30s. Serafino Riva, nephew of the founder Pietro, was in fact the first to equip with piston engines some boats whose aerodynamic lines had been studied expressly to participate to nautical competitions and to reach, with one of them, the speed of 24 Km/h in 1912. Twenty years later, in the ‘50s, his son Carlo transformed the Riva name, which had become famous thanks to speed, in a true legend by starting producing more elegant and comfortable yachts dedicated to pleasure boating. These yachts maintained the pureness and aerodynamics lines that had made the fortune of his father’s boats; characteristics maintained unchanged even in the Riva yachts produced nowadays. Once again Riva confirmed its partnership with Credit Suisse, putting this time its brand and its famous yachts at disposal of the Private Banking Society’s guests. On the occasion of the “Giro del Veneto Classic” first edition, an historic cars’ race organized every year by Credit Suisse, in fact, Riva offered the two couples winner of the competition a tour of the lagoon onboard an Aquariva Cento and an Aquarama. Australia’s most awarded luxury boat builder, Riviera, has added another major trophy to its collection, winning the Australian Boat of The Year at the marine industry national awards ceremony last night. 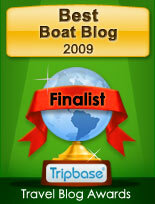 This is the second consecutive Boat of The Year award for Riviera. The Riviera 4400 Sport Yacht, with revolutionary Volvo Penta IPS propulsion, took the award against strong competition across the entire Australian boating industry. Phil Candler, Riviera’s General Manager New Product Development, said the entire staff at the company’s headquarters on Queensland’s Gold Coast was delighted with the win. The win come on the heels of the Riviera 47 Enclosed Flybridge winning the Modern Boating Cruiser of the Year award announced just four weeks ago. Last year, Riviera won Boat of The Year with its 4700 Sport Yacht. Every model in the Riviera Sport Yacht range has won awards. The first, the 3600 Sport Yacht took Modern Boating Cruiser of the Year in 2006 and went on to win the Christofle Asia Motor Yacht Under 40 ft in 2007. 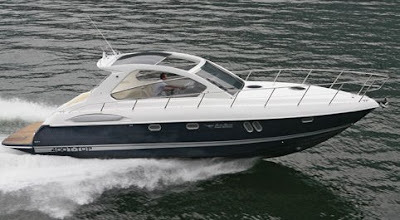 The 4700 Sport first won the Modern Boating Cruiser of the Year in 2007 and went on to win AMIF Boat of the Year. The company yesterday announced the next model in the range, the four-cabin 5800 Sport Yacht with triple Volvo Penta IPS propulsion. The boat will be launched early next year. The Riviera 4400 Sport Yacht, launched at the Sydney International Boat Show in August last year, is a two-cabin/two bathroom model that continues the al fresco lifestyle design concepts first introduced on the award winning Riviera 3600 Sport Yacht in 2005. After weathering the storm for several choppy years, Australia's biggest boatbuilder has finally caught a cold. Responding to a cooling market, Riviera announced 136 redundancies of its full-time workforce effective immediately this week.The reason for the cuts is that demand for its award-winning flybridge cruisers, sport yachts and sports cruisers is down on previous years. The Gold Coast boatbuilder says it usually has about 85 orders placed each quarter. But in the first three months of this year there were 71 and it expects sales to fall further. Consequently, Riviera is projecting a 14 per cent downturn in revenue for 2008-2009. Following the restructure, the company's workforce will total 950 at the Coomera site. Redundancies would come from across the company's entire operation and several external contracts were brought back in-house. Riviera has been hit by the languid American economy. The yard exports roughly half of the 300-odd boats it builds each year. At the same time, it's expecting the European market to soften further. But going against the trend, riding on the back of strong oil prices, are emerging Middle East markets. Meanwhile, business confidence has plummeted in Australia this year, sending shockwaves through the boating industry. Demand for its smaller boats has also been hit by the strong Aussie dollar. Increasingly, imported craft are stealing market share, especially in the competitive arena of sportscruisers. 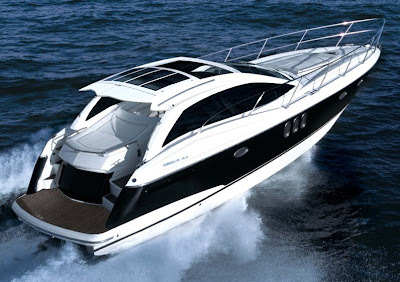 Sales of Rivieras under AU$500,000 are slow and, tellingly, the price of its best-selling boat, the 47 Open Flybridge, is more than AU$1 million these days.Of course, rising interest rates and high petrol prices have contributed to declining boat sales. And an unusually wet summer was cited as a reason for fewer people going boating on the East Coast of Australia. Yet Riviera is on track for its scheduled new boat releases this year. These include a new 70 footer costing from AUS$4.75 million. There were four confirmed forward orders for the flagship at the time of writing. After having announced the launch of a 65 feet model for 2009, Sessa Marine is today one of the first European shipyards to open an internal research centre dedicated to new product development, a way for this fast growing company to equip itself with the best tools for its debut on the yacht market. The structure represents a 4 M€ investment spread over two years and covers an area of 1500 m2. It contains a 30 work station research department (including 12 CAD 3D work stations) and a building devoted to producing new moulds. The Sessa R&D centre is equipped with an automatic cutting machine ordered by CAD CAM technology for the manufacture of large dimension moulds. 1:1 scale prototypes of the new projects will be manufactured, from which the moulds will be produced at the R&D centre. Stratification, polishing and finishing work on the moulds; critical phases for ensuring the perfect quality of the finished product, will continue to be handled by the shipyard. The first model to be released from Sessa’s R&D centre will be the C65, closely followed by two Flybridge models and the new Open, which will complete the Sessa Marine YACHT LINE range. To create a modern, calm and luminous work atmosphere, conducive to creativity, the brand’s designer Christian Grande has been entrusted with the layout of the centre. Of particular note is his arrangement of the superb furniture line signed by the French architect Jean Nouvel. The audio-visual installation onboard a Sunseeker 37 Metre Tri-Deck Yacht has received national recognition at the recent CEDIA (Custom Electronic Design and Installation Association) Awards. Bournemouth-based Dawsons AV Marine, won the Best Marine category at the awards ceremony, the first time such a category has been entered to recognise excellence within the custom installation industry. The AV installation onboard the Sunseeker 37 Metre Tri-Deck was recognized as best installation on a superyacht. Judges evaluated entries on the quality of design and installation, technical and design innovation as well as project objectives and overall results. Established to recognize and reward high quality system design, installation and integration, the CEDIA Awards help to set the standard for CEDIA Electronic Systems Professional Members. Using the most technologically advanced products available within the audio-visual industry, the Sunseeker 37 Metre Tri-Deck was the first Sunseeker superyacht ever to have a Bang & Olufsen/Crestron AV interface. Most Sunseeker motoryachts can be customised with a factory-approved Bang & Olufsen system, planned and fitted by Dawsons AV Marine specialists, which can link across every saloon, deck space and cabin – using just one remote control. This famous lake Como boat builder, upgrades the T-Top range with the new 400 model, joining the successful 4300 in the range. As all Airon Marine boats we are treated to a sports elegant line, with the hard top adding an extra bonus of an all weather comfort to the boat. Interior accommodation is for 5 berths in 2 cabins, with the double island bed master forward and mid cabin featuring 3 single berths. Standard engine option is the 2 x Volvo Penta IPS 400 with D4 300 hp engines, giving easy manoeuvrability inside the harbours and tight spots alike thanks to the extra joystick. Top speeds with the IPS 400s is of a 35 knots maximum and 32 knots continues cruising. Still for high performance a stern drive option is also available, with top choice for speed lovers being the big 2 x Volvo D6 370 hp. Finally new projects from Terranova Yachts, an interesting Italian builder founded in 2000, presenting a different line of displacement hulled, fiberglass built yachts with exterior looks similar to those of a small tug ship but with plenty of yacht sensibility around. The first model of this youngish company was the 85 Explorer model and later followed by the smaller 68 Explorer. Now Terranova aims at growing its range of motor yachts to a wider audience with the new 58 Explorer, an interesting 18 meter project with a three cabin layout, featuring VIP and owners cabin, third L-shaped double cabin and an extra spacious crew cabin aft. The new 58 Explorer unlike the other models of the range will also have a semi displacement hull, aimed at a versatile owner, and project estimates so far give a cruising speed of 16 knots with twin 550hp Cummins engines. Terranova 85 Explorer One project, is developed on the same full displacement hull of the 85 Explorer with the principal difference being a single deck version. Obviously the lower deck keeps the same spacious 4 cabin environment, with the big full beam owners cabin and two or three berth crew quarters forward. Speed should also be in the same league as the two deck sister ship, with cruising speeds of 13 knots, with twin MAN 700hp engines. The 115 Explorer is the flagship of the Terranova range of displacement yachts, and as the pictures show is in advanced stages of being launched. As all the other Terranova but something rare for displacement craft it is built entirely in fiberglass. The project is designed by Barracuda Yachts of Spain and as all Terranova it is constructed in Italy. The interior spaces are also what is expected from a yacht of this size, with a net separation of the owner's domain from the rest of his guests and crew. The Terranova flagship is a three deck motor yacht, and as all Terranova yachts is classified by RINA to CE Category A standards. 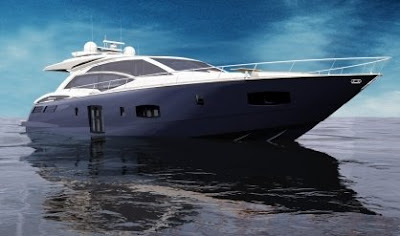 Her displacement hull should give cruising speeds of about 13 knots, with twin MAN 900hp engines. The Dubai Victory Team maintained their 100 per cent start to the season as Mohammed Al Marri and Nadir Bin Hendi led home a Victory one-two in the Hypo Group Montenegrin Grand Prix in Budva. Victory 1 dominated the 23-lap, 93.83Nm race from start to finish too win comfortably from team-mates Victory 7, with Middle East rivals, taking third place in Qatar 95. Today’s result was a remarkable return to racing for the 2001 World and 2005 Middle East Champion, Al Marri. Out of the sport for more than a year, the 46 year-old driver stepped out of retirement to replace the injured Arif Al Zafeen the defending World Champion, and produced a vintage performance, celebrating his 56th Class 1 start with the tenth win of his career. The Qatar 96 crew, desperate to halt Victory’s early charge in the defence of their title, lost out in the race to the first turn buoy and trailed the two Dubai boats for the first four laps before pulling ahead of Victory 7 on lap five, but a blown engine on lap 20 put paid to any late charge by the Qatari-British combination, who limped home in sixth place. As Qatari hopes crumbled, Victory 7 regained the second place they had enjoyed for the first four laps, after a blistering start saw them at the head of the field. For the Qatar Team there was some consolation to ease the disappointment, with Qatar 95 taking their first podium of the season. Despite a technical problem early in the race, Forest & Suardi 8 hit their target of finishing in the points to take fifth place, for the second race in a row, with Roscioli Hotels Roma’s Domenico Cirilli and Sergio Carrasco, making his Class 1 debut, finishing seventh. But there was disappointment for SeveneleveN, who had to sit out the race after an engine problem in the morning’s practice session. On the heels of the 2200 Fly success, of which 40 have been built, Couach Shipyard set on updating this successful model. The objective was to modernise her exterior lines while preserving the seagoing qualities of this vessel originally designed for demanding owners, eager to set sail on their own on board a fast large yacht. Comfort and safety on board remain unrivalled, and without yielding to marine qualities that has made his predecessor famous the 2300 Fly, which first example will be launched at the beginning of 2009, will feature lighter and airier exterior and interior layouts: an extended fly that can receive a hard top, sideways enlarged making easier movement on deck, an elegant high bulwark echoing larger models of the range, redesigned portholes and windows being enlarged to bring more natural light and a bow shaped to a point that slimes down her line and position her definitively in the Yacht category. The comfortable and luxurious 4-cabin version is fully costumed as far as the decoration and materials are concerned, leaving the owner imagination to decorate his yacht. The main cabin has also been redesigned and enlarged giving a greater comfort feeling. As ever, equipment on board is top quality and compliant with Yachting standard for maximum comfort and safety. With her twin MTU 1500hp, or MAN 1300hp this new 2300 Fly benefits from a remarkable seaworthiness at any speed and perfect passage at sea thanks to her high performance deep Vee shaped hull. Faithful to her predecessor reputation she offers a cruising speed of about 30 knots and a max speed of 36 with the big engine option. Another weekend of challenging racing in Marseilles, South of France for the Powerboat P1 circus. The second way point of the 2008 season, was an impressive duel with wind and rough waters showing the typical crazy conditions of the Mediterranean breeze of which this particular harbour has a fame for. The other big challenge which all the competitors are facing is to stop the 2007 champions, which so far seem unstoppable. May be last year we might not have seen the full potential of the winners in the respective classes! The 99 Fountain 1st4boats.com took a dominant win in Saturday Evolution class Sprint race of the Grand Prix de Marseille, heading home the 88 Kiton Outerlimits OSG Racing boat and the 10 Fantastic 1 Cigarette Racing Team in a dramatic event that had thrills and spills aplenty. The race got off to a controversial start before the boats even reached the first turn as the 99 Fountain boat and the 69 Honeyparty.com had a close shave that left the 69 Honeyparty.com boat limping back to harbour with severe hull damage. In the ensuing confusion, the majority of boats managed to miss the first buoy, allowing the 99 Fountain boat to make a clean escape before building a 20-second lead. The 88 Kiton Outerlimits boat emerged at the end of the start lap in second place, gradually easing away from a close battle between the 77 Lucas Oil team and the 10 Fantastic 1 Cigarette boat. That battle turned in the Cigarette team’s favour when the 77 Lucas Oil boat seemed to turn round the first turn buoy too tightly, making a quick course correction that allowed the 10 Fantastic 1 boat to slip ahead. A tough day turned even tougher for the 77 Lucas Oil crew as they slowly dropped back into the clutches of the 57 Centaurian Yachts team and then retired with a technical problem just two laps from the end of the race. Those fortunes contrast starkly with those of the 99 Fountain 1st4boats.com team, who have now scored their third victory on the trot (if you discount their current disqualification from the Italian Grand Prix of the Sea Sprint race). The reigning champions are looking as unbeatable as ever. Can anyone stop the 99 Fountain 1st4boats.com team? In another spectacular display in incredibly rough conditions, the reigning champion crew won the shortened Endurance race of the Grand Prix de Marseille in southern France, and secured the overall Grand Prix of the Sea victory with a full 200-point score. This wasn’t the Fountain team’s easiest win, though, as they first had to come from behind and then defend their lead from a variety of rival challenges. After a typically chaotic first lap, the 69 Honeyparty.com boat took the early lead from the 53 Pignolo 53 entry, with the 77 Lucas Oil crew, the 10 Fantastic 1 Cigarette Racing Team Europe entry and the 99 Fountain 1st4boats.com duo rounding out the top five. The Fountain crew were very quickly on the move, though, passing the Cigarette boat for fourth by the end of the first full flying lap. On lap four, they moved past the 77 Lucas Oil boat into third, which quickly became second as technical gremlins once again blighted the British-based 69 Honeyparty.com boat, forcing a halt, ending another another frustratingly pointless weekend. 53 Pignolo did well to hold off the challenge from the 99 Fountain boat for the lead, but Sheppard and Wilson lurked perfectly on the 53 boat's wake and moved ahead on lap five before quickly pulling clear. The race came to a thrilling climax as first the 10 Fantastic 1 Cigarette boat ground to a halt from third place with what looked suspiciously like engine problems. That allowed the 60 GFN Gibellato diesel-powered boat to show its rough-weather form by moving into third, before powering past the 53 Pignolo 53 boat to take second on the final lap. The 88 Kiton Outerlimits OSG Racing rounded out the full race finishers in fourth place. There was more heartbreak for the pre-weekend championship leading 77 Lucas Oil team as they slowed from third place in the mid-stages of the race and limped home with only one working engine. They lost their championship lead, while reigning Evolution title winners Fountain Worldwide move into a clear lead that could get even bigger if they recover the 100 points they lost in the Italian Grand Prix of the Sea Sprint race in appeal. Two teams with even bigger post-weekend headaches are the German 66 Cranefields Wine Searex Racing team and the Belgian 57 Centaurian Yachts entry, both of whom ended up limping back to the harbour midway through the race with battle damage from the first lap chaos. The 57 Centaurian Yachts entry was particularly badly damaged, with a huge hole in the right-hand side of the boat. With plenty of battle-scarred boats to repair after a bruising rough Grand Prix de Marseille weekend, and a lot of catching up to do if anyone wants to overhaul the 99 Fountain team, it looks like a busy couple of weeks for the Evolution teams in the gap before the Malta Grand Prix of the Sea. But, for Powerboat P1 fans, if the racing is anything like this weekend, then we can't wait...! The reigning champion 44 Conam Yachts crew continued their dominance of the SuperSport class in the Sprint race of the Grand Prix de Marseille. 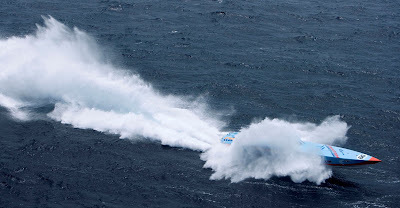 The Italian-based led home the 59 Saho Offshore Rana’s boat and the 08 Phoenix TV team, with an almost three-minute lead at the chequered flag. The battle for second place was initially an incredibly close-fought scrap between the 47 Silverline Buzzi Bullet and 07 VoomVoom.com crews, but both boats ground to a halt midway through the race with technical problems, severely hampering their bid to stay ahead of the 44 Conam Yachts crew at the top of the points table. The 44 Conam Yachts team continued their impressive start to their SuperSport title defence in France, dominating the shortened Endurance race of the Grand Prix de Marseille to complete a weekend double victory and secure overall Grand Prix of the Sea victory, leading the way from the start to win by a comfortable 26-second margin from the 07 VoomVoom.com and 08 Phoenix TV boats. That puts the reigning champions back in the lead of the SuperSport class, with an 80-point advantage over the 08 Phoenix TV crew. The 38 Baia High Performance crew got the better of the 47 Silverline Buzzi Bullet boat in the scrap for fourth place, while the 59 Saho crew did a solid job to recover to sixth place after missing the first turn buoy and dropping to the tail end of the field. The 46 Spirit of Portomaso boat rounded out the race finishers, with the 22 Big Sergio retiring from the race and the 11 Sunseeker team failing to start after yesterday Saturday’s practice incident that resulted in the team’s entry sinking. A personal detailed review for May, into one of my preferred 11 metre sports cruisers the Rivera 3600 Sport Yacht. Renowned and largest Australian yacht builder, Riviera got a strong fame for building seaworthy, well built sport fisherman cruisers and yachts in over 25 years, so when the Australian builder went to built a modern hard top cruiser, everyone was curious of the out come. The 3600 Sport Yacht was the answer, as it did keep the all important Riviera lines added with some modern design and construction touches. It did respond well with the professionals, winning two important awards in 2 years: 2006 Overall Cruiser of the Year by Prestigious Yachting Magazine Australia and 2007 Best Motoryacht under 40 ft by Christophle Asia Boating Magazine. A success announced at the start! A comfortable Sport Cruiser, which scores a lot of points thanks to the very intelligent living area on the upper deck, which with the full opening of the patio door and swing window, joins the interior with the exterior and the L-shaped saloon settee, galley entertainment area with the cockpit deck, making it a single area for spacious socializing. This practical interior saloon is also filled with natural light, air and views, thanks to the 2 opening sunroof hatches, and big opening side windows when the weather is nice and if it is does get bad, don't worry you can close it all in a few seconds, and make it a cosy place for chilling out. As for the lower deck, this is all dedicated to the sleeping quarters, with a spacious owners cabin forward featuring a central located double island berth, a spacious head with separate shower stall and a second double bunk cabin. I like the solution used of creating an entertaining area up top with cabins only below, as especially in warm climate zones the lower saloon does not get used much. Derived from a sport fishing hull with design from renowned Dutch architect Frank Mulder, the small of the Sport Yacht series does offer the goods. Its hull shape is a very deep vee forward section with a moderate vee aft, with the propellers running in tunnels for maximum efficiency, better handling and smaller turning circle. Exhaust is also an underwater system, which does add additional lift and gives lower planning speeds. The Riviera is surely not the fastest 11 metre sports cruiser, but I am sure that when the sea starts breaking off, it may come out as one of the most secure. 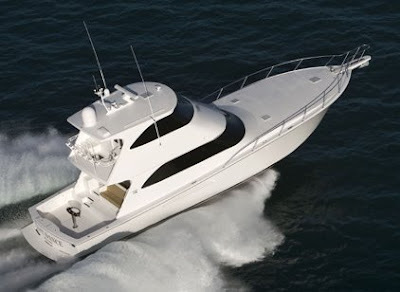 Many are big fans for American sport fisherman yachts, admiring them in harbours and seeing the way most perform at sea is always an experience to anyone who loves planning motor boats. But somehow if you live in Europe and you don't do fishing you will always find it difficult to purchase one of these so called beasts! Riviera with the Sport Yacht series have to be praised for completing a circle, creating a new breed of cruisers, with hull lines derived from the Sport Fisherman with all the sea qualities included and adding a classy profile of a timeless Sport Yacht as the title says. By joining these 2 boating Worlds and putting the bonus of a super practical all weather hard top sport cruiser, Riviera did create the revolution and the success obtained by this range is testimony to this. Picture Copyright Riviera. Data Riviera. As if the 50 Continental was not innovative enough, thanks to its transformable interiors, this Italian yard comes with the Tender version for the same model, aimed at giving unlimited outside space with a loft style interior. The project for the Tender version of the 50 Continental was announced just a bit later to the standard version, and Cantieri Mediterraneo have to be praised for producing big opens with a very different concept from what the major competition is doing. 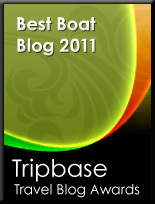 If you are looking for a big day boat with weekend accommodation for 2 there is not much going more then this. 50 Continental Tender, as the standard sister also scores a lot of points for the big offer in propulsion going from latest IPS, to high performance Arneson Surface Drives or to super handling water Jet propulsion. Dubai’s Victory Team will be without defending Class 1 World and European Champion, Arif Saif Al Zafeen, when the intense rivalry between the sport’s top two teams is reignited at this weekend’s Hypo Group Montenegrin at the Adriatic resort of Budva, round two of the 2008 Class 1 World Powerboat Championship and the first of four races for the Class 1 tour in Europe. Victory 1’s Al Zafeen, winner of the opening Edox Pole Position and Grand Prix of the season in Qatar in March is forced to sit out the race on medical advice after sustaining serious back injuries in a crash during a Formula 2 race in Egypt several weeks ago. But whilst the loss of Al Zafeen, who has won five Grands Prix from just nine starts, is a bitter blow for the team, Victory has been able to call on the services of former World and Middle East Champion, Mohammed Al Marri, a veteran of 55 Grands Prix, with nine race wins and 26 podiums under his belt to step into the driver’s seat. Victory’s main championship rivals, Qatar 96, will see this enforced change as an opportunity to put pressure on the championship leaders and close the gap in the title race by taking their first win of the season. And although Hassan and Curtis will be running their spare boat for a second consecutive race, after wrecking their number one boat in qualifying in Qatar a switch from the Mercury-Class1 V8s back to Skema V12 power-plants, and considerable modifications to Qatar 96 carried out by Nicolini Offshore in Italy, may well give them the extra edge they need. Whilst the Victory and Qatar camps will be intent on maintaining their early stranglehold on the top four positions in the championship standings Victory 7 lying in third place ahead of Qatar 95 wait for any challenge to their race hopes could well depend largely on the conditions that the teams will face in Budva, when they line up for the 23-lap, 94.50 Nm Hypo Group Montenegrin Grand Prix. If the seas on the outside leg of the course around the Island of Sveti Nikola are rough, Foresti & Suardi and Jotun may well be amongst the challengers for podium positions. Foresti & Suardi’s Italian-Norwegian pairing are back in their favoured number one raceboat and have clocked up the miles testing on Italy’s Lake Iseo in the last two weeks, hoping that they can build on their fifth place in the season opener, especially if rough conditions prevail. Ugland Offshore Racing will be looking to kick-start their title challenge and put points on the board after seeing a probable podium finish slip from their grasp in the last race, and the all-Norwegian crew will be boosted by the fact that their Mercury-Class 1, V8 powered raceboat, Jotun, has undergone a significant overhaul in recent weeks. Giorgioffshore produced a very solid top-six finish last time out, and will be looking to build on their performance and expect an improved showing when they line up in Budva in only their second outing in their Michael Peters-designed Victory-built hull, SeveneleveN, with the all-new Spanish outfit of Roscioli Hotels Roma and American-based, Windmare Racing, making their 2008 debuts this weekend. Montenegro is the first of two new venues on the eight race calendar in 2008, and the picturesque resort of Budva on the Adriatic coast provides a spectacular backdrop for the championship’s first race on European waters this year. First practice takes place on Friday 23, followed by a second session and the Edox Pole Position on Saturday, with a final practice before Sunday afternoon’s 23-lap, 94.50Nm Hypo Group Montenegrin Grand Prix. A flagship project for this young Italian shipyard, the new Absolute 70. 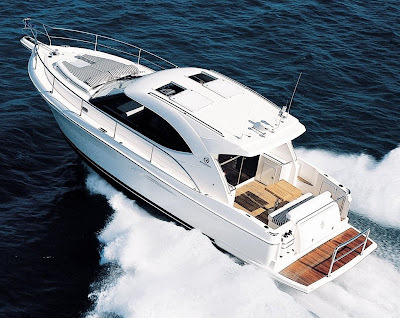 Piacenza located Absolute has had much success with it's range of sport cruiser models since this yard showed up in 2002 especially in the sport cruiser 11 - 13 metre segment. With the new 70, Absolute introduces an innovative project and as most of the competition in this segment of the market, follows the concept of a hard top design, offering the comfort of a more bulky flybridge boat, but with an aggressive appearance on the outside and faster performance on the water. Interior comforts will be for a 3 cabin layout, with the Owner and VIP cabins promising to be a lounge with big full windows for maximum natural light and top views, a theme which is followed in all of the yacht from the upper saloon down to the cabins. The new Absolute will also surprise for it's four by IPS 600 propulsion and a very sophisticated on board computer system. Hull no.1 is expected to launch in August, with world preview for the next Cannes show. A new important installment in the Absolute range, in a size which makes it one of today's top European builders, is the new 43, replacing the successful 45 model and taking it's prime spot between the 41 and 47 models. The new 43 looks very much similar to the recently launched 47 on the outside, thanks most to the hardtop, very look alike, but also to the now famous hull lines which makes it easy for everyone to recognize it is an Absolute. The new 43 will also feature same engine configuration as the 47, with Volvo IPS 500 or 600 power, which should give top speeds of above 40 knots, making it the fastest for Volvo's innovative propulsion system. Interior for the new 43 will have 2 spacious cabins, plus a convertible saloon all introduced with latest minimalist geometries and top finished wood, metal furnishings. Powerboat P1’s successful 2008 season opening Italian Grand Prix of the Sea in San Benedetto del Tronto in Italy may still be fresh in the mind for the sport’s fans, but most of the teams are now much more focused for the coming weekend upcoming Marseille Grand Prix. The city authorities and the Federation Francaise Motonautique and the Motor Yacht Club de la Cote D’Azur have been busy preparing for the event in recent days. But given the amount of technical teething problems that teams in the Evolution and SuperSport class seemed to suffer in the opening Endurance and Sprint races of the year in Italy, we’re hearing that there have been plenty of furrowed brows, as engineers and mechanics try to fix the glitches. We should expect plenty of late-night ‘bags under the eyes’ as teams arrive in Marseille. In the Evolution class, the 77 Lucas Oil team seemed to have the most trouble-free weekend, as indicated by their healthy lead at the top of the standings. But they’ll be looking to see where they can catch the 99 Fountain Worldwide boat, who were clearly quickest on the water, and would have been leading the way into France had it not been for their provisional 100-point penalty. The rest of the field, particularly leading teams like the 10 Fantastic 1 Cigarette Racing Team Europe outfit, the 88 Kiton Outerlimits OSG Racing squad and the 69 Honeyparty.com crew, will be keen to solve the problems that blighted their Italian weekend so they can come back fighting in France. In the SuperSport class things are proving so closely contested that everyone will be looking to gain that crucial advantage that will allow them to move ahead of their rivals. The 07 VoomVoom.com team, the 44 Conam Yachts crew and the 59 Saho Offshore Rana’s outfit lead the way in the incredibly tight points race, but the 38 Baia High Performance boat, the 11 Sunseeker Challenger team, 47 Silverline Buzzi Bullet crew and 08 Phoenix 8 squad are all perfectly poised to make big headway in the title fight if they can find the magic mix, or if one of the leading teams suffers a technical problem in France. Please note that for the coming weekend race, a revised schedule has been updated with races being held after each other and both in the afternoon, for better following visit the official Powerboat P1 site. A project for a new model from this builder is always a bit of a news, as it is on the conservative side of things in presenting additions to it's range, having on average added models every 2 years. Expected but also challenging is the important size of the new Baia which will be a hundred footer Super Sport Yacht or as the title for the project says One Hundred. It will be the new Baia flagship, but not the biggest built by the Naples builder as it did deliver a one off 105 footer flybridge yacht in the nineties. The renderings for the new One Hundred follow what this builder offered in the last decade, that of improving its classic design into new borders of innovation and comfort, without boundaries, transforming and joining areas as the client would wish at the moment. Among the most interesting practical innovations for the Hundred looks to be the forward deck area, which is connected to the interior through an innovative opening at the bow. The new big Baia will be powered by latest generation twin MTU 16V2000 M93 delivering 2450hp each with Arneson Surface Drives propulsion, of which this builder has a special experience for using and taking out the best potential from. At this stage it is just about the wait to see the new Baia flagship for real, which as a passionate I hope very soon. The Enclosed Bridge version for the 60 Viking, adds luxury to this model and more. This highly respected USA builder has been building Enclosed Bridges Sport Fisherman yachts from 1995, launching in that season the first of the series with the 58 EB and now spanning all the range from 56 to the 74 models. The 60 Enclosed Bridge version in respect to the Convertible adds comfort and an extra luxury fully climate controlled upper saloon. In fact this luxury appointed helm station has some important bonuses like the internal staircase, a luxury appointed L-shaped saloon to port and a small settee to starboard for the helmsman guests. Useless to say that the upper bridge makes much sense as an extra luxury appointed upper station but also a fully upper saloon fit out for threatening the guests at anchor and underway. Viking also make the possibility of fitting an option called the skybridge, a cozy flybridge sitting on top of the Enclosed Bridge. If it's a high helm station you are looking for, it can be assured that the New Jersey builder has all the answers. An innovative young Italian yacht builder with a modern futurisic design presents it's second model, which follows the themes shown for the first of a fast fully enclosed hardtop model. 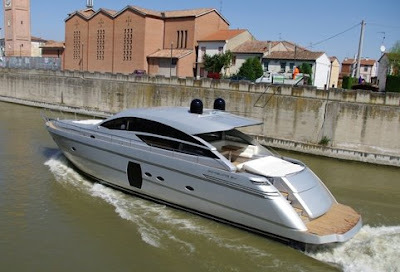 The Sogica Openbridge series is the Performance Motoryachts range of Sogica, proving quite a success with the 55 model. As the 55 Openbridge the new 47 Openbridge shows an open layout full of space and accommodation which the shipyard promises will be hard to beat in this size and length. The new Sogica 47 Openbridge is powered by twin Volvo Penta IPS 600 engines, giving estimated top speeds of 35 knots, 29 knots cruising and a good range of 350 nautical miles. 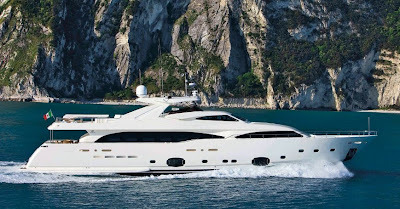 Presented during the Ferretti Privilege days held in April, is the new version for the planning Ferretti Custom Line 112 model, now added with the title Next. As the title suggests the Zuccon designed motor yacht heads into the next dimension of a modern Super Yacht, helped with the adding on the exterior of big side windows for the main cabins, but also for a stylish hard top on the upper deck, which really integrates with the design in a perfect stylish way. Something to accept from this respected top Super Yacht builder! The new 112 Next follows the modernisation also inside with a 5 cabin interior layout, featuring a spacious full view owners suite on the main deck. Top speed is an estimated maximum of 27 knots, with latest MTU 2040 kw engines. 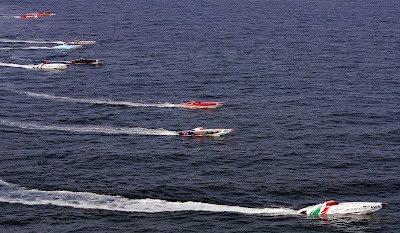 Certification - RINA 100-1-1.1 "Y"
Pulses have been racing during an action packed weekend of world championship power boating with the sun drenched resort of San Benedetto del Tronto providing perfect race conditions for the opening two rounds in the 2008 Powerboat P1 season. With 22 teams competing for the prestigious UIM Powerboat P1 World Championship title, the VoomVoom.com and Fountain Worldwide racing took overall victory to take the Italian Grand Prix of the Sea in the SuperSport and Evolution Classes. What could have been a nightmare weekend turned into a dream weekend to remember for the 99 Fountain Worldwide reigning Evolution champion as they took victory in Sunday’s Sprint race and secured the Italian Grand Prix of the Sea trophy. Fountain Worldwide crew faced a nerve-racking wait as transport problems meant their Ilmor-powered Fountain boat was delayed in the USA. Despite the boat arriving in the San Benedetto del Tronto harbour at 06:00am on Saturday morning, the duo fought back in the Endurance race to start their title defence in superb style. It was a return to their dominant winning ways of 2007 in today’s Sprint event, establishing a clear lead on the opening lap and were never headed as they completed the run to the chequered flag. But that doesn’t mean their win was easy. Finishing second in the sprint was local hero in the Veneta Marina Metamarine Corse-run 60 GFN Gibellato. The diesel Seatek-powered entry was the only boat able to keep up consistently with the 99 Fountain Worldwide entry, and the podium finish was a perfect way to celebrate in the harbour where his Metamarine team is based. In third came the 77 Lucas Oil boat, after briefly dropping back behind the 53 Pignolo 53 Skater Racing Team entry in the early stages, the pair fought their way past on the final lap to cap a perfect debut weekend for the new team. With another podium added to their second place in the Sprint race, they finished second in the Italian Grand Prix of the Sea standings. After the Endurance race of attrition, the Sprint event proved equally trying for some of the other leading boats in the class. Of particular note was the 88 Kiton Outerlimits entry of 2006 champion, which was forced out with engine failure in an almost-near repeat of their steering problems in the Endurance race. But Cangiano summed up how many of the entrants felt about the typical early-season first-round blues. But with just two weeks to the next round of the 2008 Powerboat P1 championship in Marseille, France, all the teams have a lot of work to do to catch the 99 Fountain Worldwide crew. The 07 VoomVoom.com crew had the perfect surprise ending to their Italian Grand Prix of the Sea weekend, inheriting the SuperSport Sprint race win after the Endurance race-winning 44 Conam Yachts boat was handed a two-minute penalty for jumping the start. The Sprint victory, allied to the 07 VoomVoom.com team’s second place in the Saturday Sprint race gave the overall victory in the Italian Grand Prix of the Sea weekend. On the course, the 44 Conam Yachts crew led the way from 59 Saho Offshore Rana’s team and the 07 VoomVoom.com boat, but the two-minute penalties that were ultimately applied to the 44 Conam Yachts and 59 Saho boats dropped them back down the order. A second victory of the weekend would have given Ciantar and Tedeschi a clear lead in the Italian Grand Prix of the Sea and a crucial early-season lead in the standings after their home event, but sadly it wasn’t to be. It only became clear to the 44 Conam Yachts crew of their narrowly missed win when they reached the harbour. The new Sunseeker 34 Metre Yacht was previewed World wide to the public during the London Boat Show. Boasting a broad beam and a most spacious and sophisticated interior, this new Super Yacht from the renowned British builder provides luxurious accommodation for up to ten guests plus crew. The open plan living areas include a large saloon and dining area adjacent to a fully equipped galley and servery including crew mess which form a natural divide from the forward master stateroom, raised wheelhouse and crew quarters. The lower deck includes two generous double VIP cabins and two twin cabins, all offering en suite facilities and individual entertainment systems. The spacious main deck master stateroom is a duplex design which gives 180-degree visibility with a walk-in wardrobe on the main deck. Stairs then lead forward to a private toilet room and then down to an open plan en-suite with twin wash basins, bath and separate shower cubicle. The flybridge affords plenty of seating and sunbathing space with a fully equipped wetbar and the option of a large spa tub, and depending on the owner's requirement, the stern garage offers enough space for a tender. To achieve optimum performance, the 34 Metre Yacht is based on Sunseeker's proven deep 'V' hull design. A choice of powerful twin diesel engines provides up to 4800hp, enabling this yacht to achieve top speeds of 26 knots. Performance, complemented by leading-edge technology throughout, such as computerised engine management systems and the very latest navigation and communication equipment, makes island hopping or extended cruising equally effortless. There is also the option of fitting TRAC-STAR, a system that provides optimum stabilisation while at rest and when underway. The 34 Metre Yacht will be built to meet the requirements of regulating authorities including the Marine Coastguard Agency (MCA) dependent on owners' specifications. And here we are at the start of the prime offshore performance boat competition which this year makes the first way point in Italy, on the Eastern Adriatic Coast in San Benedetto Del Tronto. This year competition will have some important rule changes aimed at improving the competitive side of this ever growing motor, water sports. Of the new changes without going too much on the technical side of things, is the separate racing for the two classes, with Supersport starting late morning and the faster Evolution class in the afternoon. Another important change is the speed limit which for the prime Evolution Class is non existent having been removed from the previous season, and the Supersport having a limit of 85 mph. The 2008 Season has so far 11 Teams in the Evolution Class and 9 in the semi production Supersport Class, that is the teams confirming a yearly participation and excluding the single venue wild cards. The legends of the Evolution Class return more competing then ever and champion Fountain Worldwide will have a heavy task defending the title. Starting with never ending OSG Team who for this season will race with a new official Outerlimits boat, which means the 2006 winner wants his title back. There is also some important new teams in this class, starting with a really welcomed surprise of which I am amazed to announce myself, of the Cigarette European Team, the legendary American Powerboat brand who has written history for this sports. Another return is renowned Italian fast yacht builder Italcraft Inrizzardi Team, who written history for its hull design and propulsion innovation in the past and also raced in 2006 with 2 boats in the Supersport Class and won Evolution title in 2003. This year they return in the much demanding Evolution Class, but in the hands of experienced driver Adriano Pannatta. Other important confirmations are the return of Searex who achieved good results since competing in half of the season, last year. Italian Metamarine Corse will be at home in this venue and will want to prove that the negative 2007 season was only a track error for title conquest. 2007 season third classified Nigel Hook Racing has kept the engines of the 2007 season and gambled for a new Skater boat. After a difficult 2007 season Skater, are back again in 2008 but with new engines, in this case Ilmor power which supplied the 2007 title winner. Another team which might give some surprises is the all British HoneyParty.com, who before competing in P1, did race in the USA with very good results. In Supersport class we also have much returns from the 2007 seasons, first of which we mention defending champion Racing Project with there Chaudron boat who for the 2008 season have the sponsor support of renowned yacht builder Conam, but also a new co-driver with Aaron Ciantar of Chaudron family joining in the squad. Sunseeker Challenge also return again, with the same outfit of the not so special 2007 season, but may be the little tweaking can do the difference here. Eternal runner up team Bullet Racing who came second in 2004, 2005 and 2007 will try again to win the title this season, is this the one? Another renowned brand who will sponsor and compete is Baia High Performance OSG, with Roy Capasso marketing manager of the renowned Yacht Builder part of the crew. Seems he got addicted after winning last year the Viareggio - Monte Carlo - Viareggio with a 63 Azzurra and now gets to compete in the P1 with the Donzi boat, winner of the 2006 and runner up 2007 in Evolution. Team Al & Al compete with The Big Sergio boat, a boat dedicated to the memory of Sergio Carpentieri who sadly lost his life in the 2007 season in Germany. Spirit of Portomaso Chaudron 33, while not in the hands of the Chiantar Chaudron family will still compete, but with new Belgium owners and Mike Shelton from Extremeboat joining in as navigator. So this is it for the presentation of the first round for the 2008 season. 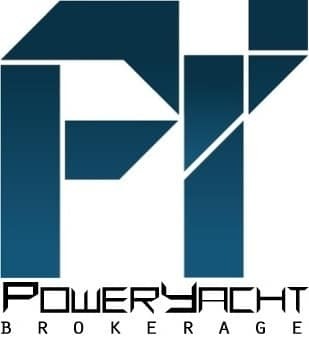 Powerboat P1 has just updated its website for the new competing season and as a viewer and follower, I gladly inform that thanks to the partnership with Virtual Spectator, the one famous for it's use in the Americas Cup it will be possible to view all racing directly from the comforts of your desktop. With the Radio addition this will make some very good racing viewing! As a final criticism to Powerboat P1 I hope the TV coverage section gets improved, as still I have no idea which channel to look, what time and if any give the races directly on TV on one of the many broadcasters listed in the official site. The new Pershing 64 follows the DNA for this World renowned Italian boat builder: avant garde design, innovation, technology and ultimate comfort. This new model from the Marchese boat builder, which has become a symbol of Made in Italy yachts, follows the roots of the Moving Idea concept as launched with the 72 model, by top designer Fulvio De Simoni, who has grown his name around this brand having designed all of it's models. Unveiled in a wonderful promotional event called "thisismorethan" which saw the Pershing 64 first official presentation moored in the heart of Milan, the World Fashion Capital but also Italian Financial Center, the 64 continues to explore new concepts for making live aboard more comfortable, creating an incredible sense of space transformable on the upper deck to suit once needs as desired. The 64 also follows the 72 Poltrona Frau exclusive use, for the soft furnishings, but also adds new concepts to its portfolio among the most striking is the windshield constructed from a single pane of glass and the exclusive oak finished foldaway deck table. Interior layout follows a conventional layout, that is for a Pershing with a VIP cabin forward, third guest cabin and full beam owner cabin mid ship. Crew cabin is located mid-ship with a separate entrance from the cockpit. Performance, which has always been one of this yards priorities, is from twin 1550 hp MAN engines with Arneson ASD 14L surface drives, giving peak speeds of 46 knots and all time cruising of 40 knots. Striking for the new Pershing is the comfort and space which match those of flybridge yacht, but with the added bonus of ultimate performance of 40 knots plus and the transformation to an open boat which makes it also better for the hot climate user. 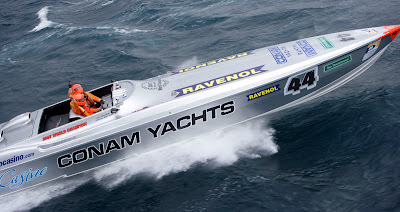 Powerboat P1 enters the 2008 season on full throttle as a record number of competitors prepare to embark on 14 rounds held across three continents. New events in France, Tunisia, Spain and Bahrain join familiar favourites in Malta and Portugal, while the Italian season-opener on May 9-11 moves to a new home in San Benedetto del Tronto on the Adriatic coast. The Powerboat P1 teams will also line-up for a non-championship challenge in the returning Cowes-Torquay-Cowes race on August 22-24. The line-up of Powerboat P1 teams entering the championship in 2008 is also stronger than ever before, with 12 Evolution class teams and nine SuperSport crews confirmed for the first round. A number of new technical regulations have also been introduced to make the racing closer than ever. With the unparalleled success of the Nordhavn 76 with its sophisticated systems and construction features, Pacific Asian Enterprices design, engineering and manufacturing team was ready for a larger vessel and at 86 feet, this new Nordhavn represents a firm entry into the megayacht market. With a 24-foot beam, she is more than impressive at first sight, however her full load displacement of over 148,000 kgs allows her to compare with many vessels of bigger size. Building on the experience of hundreds of thousands of ocean crossing miles and applying a form follows function rule, the new offshore passage maker was designed with in an aft wheelhouse configuration, for maximum comfort and visibility at sea. This arrangement cannot be beat and with her long foredeck forward she can accommodate tenders up to 20 feet. Taking advantage of the hull volume, the new Nordhavn 86 offers accommodations that is nothing short of remarkable with the saloon and galley measuring 36 feet in length, a full beam master cabin consuming the whole forward section and an upper section of the vessel featruing a masterful combination of wheelhouse, captain’s cabin and sky lounge measuring almost 30 feet in length. In addition to the master stateroom and captain’s cabin, the vessel includes three guest staterooms, all with private ensuite heads and an additional crew cabin and head aft with an interior and exterior entrance. A laundry and utility room is also provided. The luxurious and functional interior is finished with fine hardwoods, beautiful moldings and raised panels combined with stone floors, granite counter tops, lighting and fixtures. Construction of the new 86 is conventional fiberglass, built to extremely heavy scantlings using beautiful constructed female molds for the entire hull and deck forming a flawless structure, with a highly detailed gelcoated finish, receiving a complete Awlgrip paint job prior to assembly. Designed and built to the latest international standards, each new Nordhavn 86 can be built to ABS certification with +A1 Yachting Service rating for the hull and AMS rating for machinery and installation as an option. Twin MTU Series 60 engines rated at 600 hp each spinning 48-inch propellers allow a transatlantic cruising speed of 12 knots. With over 26,000 litres of fuel aboard and throttled back to the 10 knot range, this new design can run roughly 4,000 miles before refueling. The advanced high-pressure, common rail, electronically injected engines are fitted with wet exhaust, commercial rated transmissions with large reduction gears and offer efficiency and reliability never before possible. An extensive list of standard machinery details gives little to add to the Nordhavn 86 except electronics and tenders.